In order to meet excellent quality standards, we are supplying PVDF Intalox Saddles. 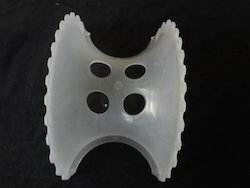 We offer plastic saddles that are available in P.P., HDPE, LTHA grade P.P. & PVDF. The finds wide application for acidic & alkaline media in gas absorbers & aeration plants. Homo Polymer grade P.P is suitable up to 95 0C and LTHA grade P.P. is suitable up to 130 0C, HDPE is suitabel up to 85 0C, PVDF is suitable up to 140 0C. We are engaged in offering PVDF Intalox Saddles. Saif Rubber & Plastic Co.
Our reputed entity is engaged in supplying PVDF Intalox Saddles. We are highly engaged in offering a wide range of PVDF Intalox Saddles. Banking on our enriched industry experience, we are able to supply PVDF Intalox Saddles. We are a top-notch organization, engaged in providing PVDF Intalox Saddles.